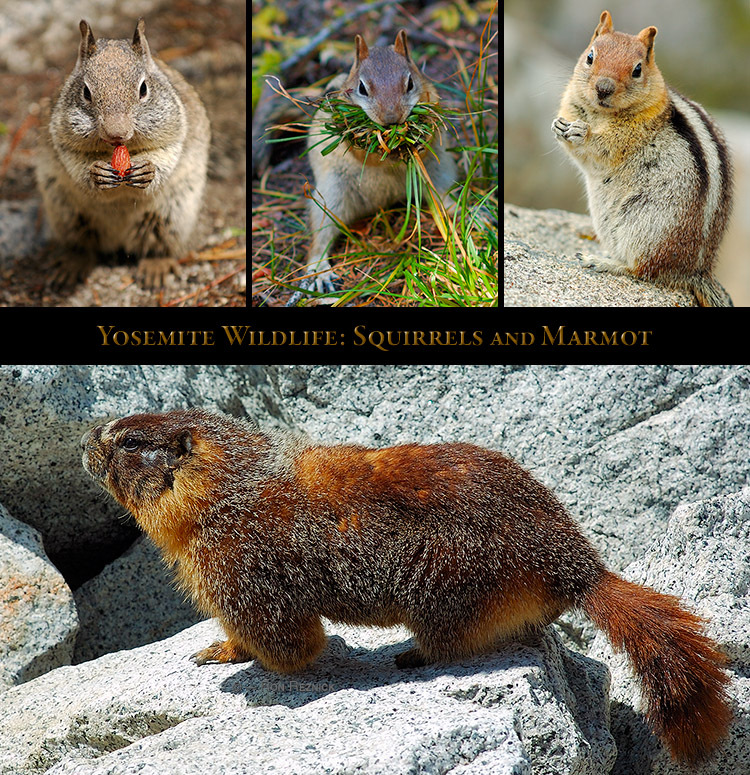 I have conducted numerous training sessions in Yosemite National Park over the years, and have several thousand images taken during these sessions and other visits. 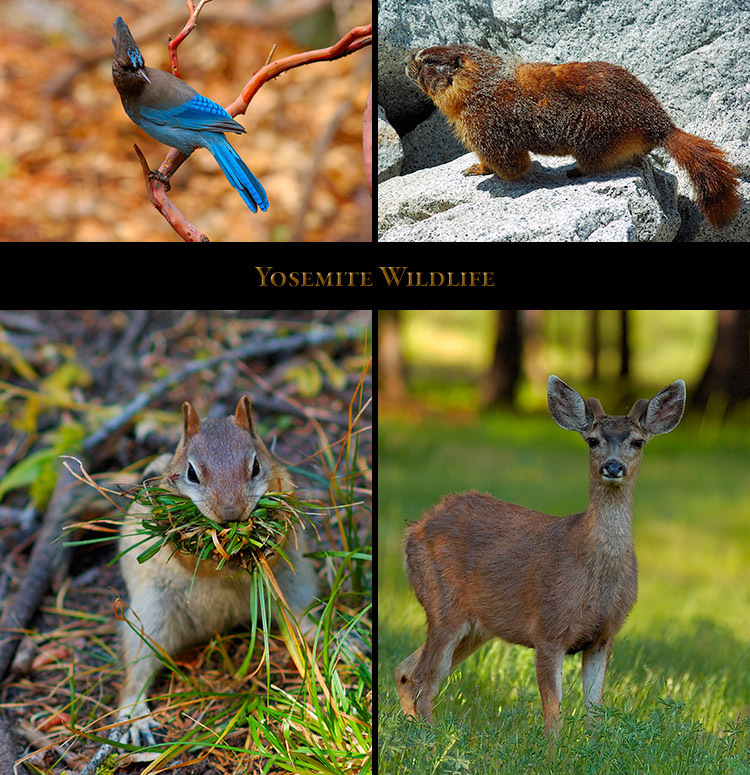 I have selected an extensive group of portfolio-grade scenic, wildlife and plant life images for the Yosemite section. Some of these images were in the previous Yosemite Valley section, and were carried over after being reprocessed. Other images are entirely new for this comprehensive rebuild. 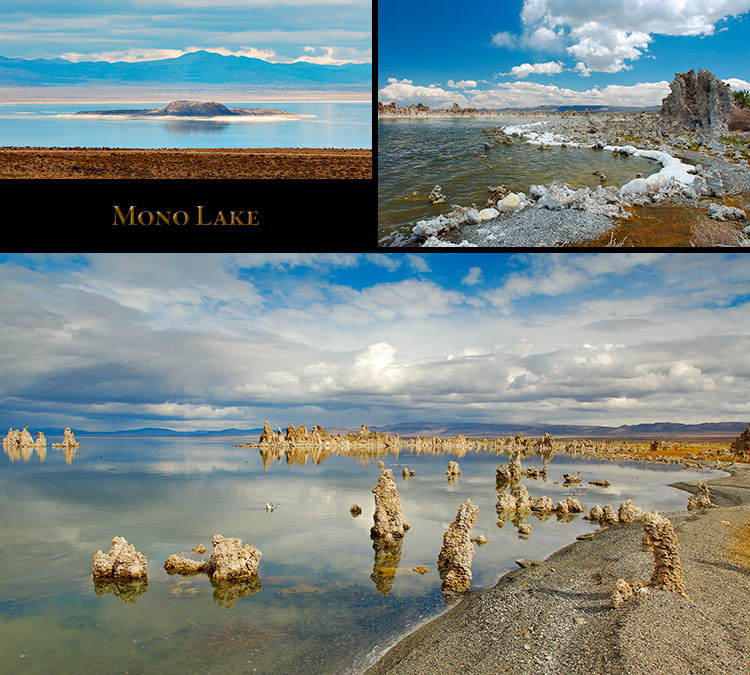 I have included separate pages with images from Mono Lake and Bodie Ghost Town (Mono Lake and Bodie are on the other side of Tioga Pass, off Highway 395), and from Mariposa (just south of Yosemite). 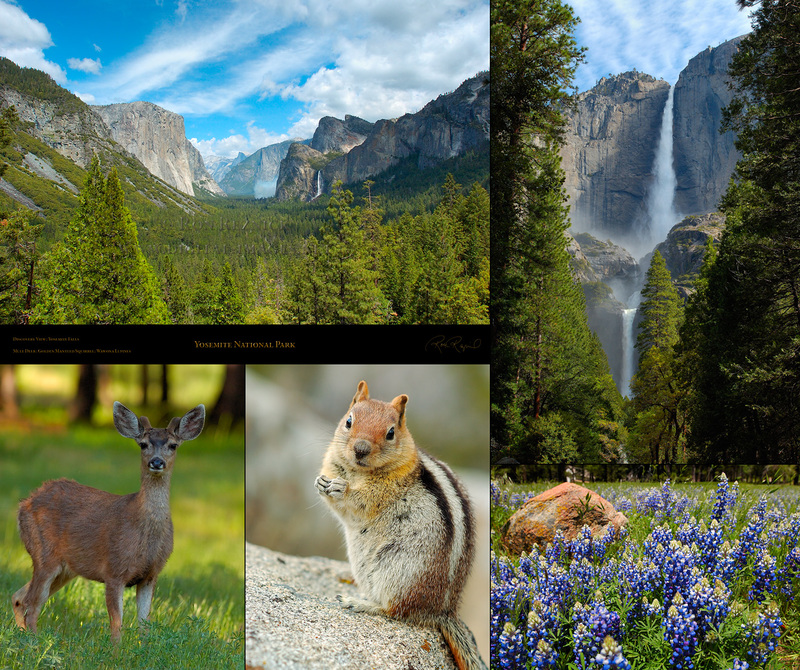 This page has Display Composites and a hyperlinked Index to the Yosemite Portfolio. 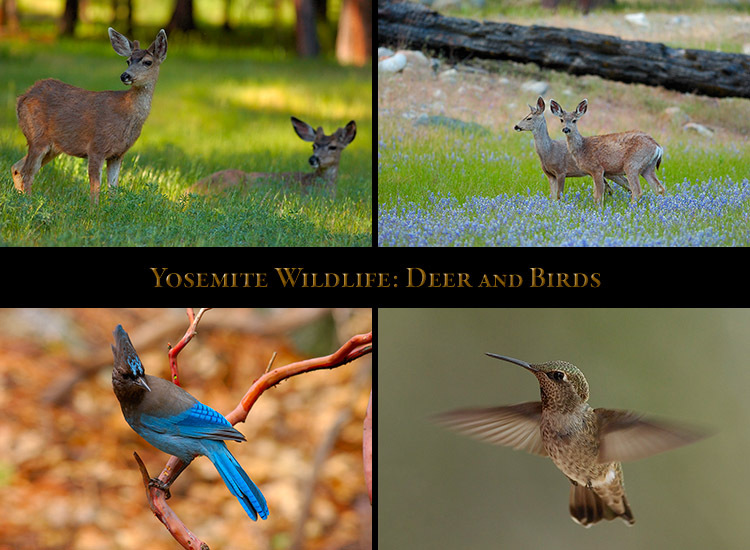 Mule Deer in the Valley meadows, Hummingbirds, Steller’s Jays, etc. Click a link above or a display composite below to select a page. 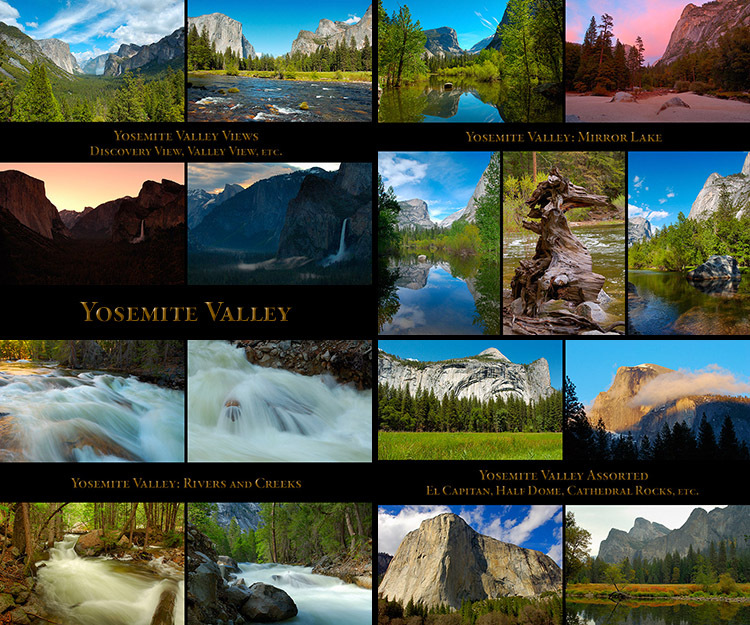 The Banner below leads to the Yosemite Collection page where a Gallery can be selected. have been copied to the Yosemite Collection from their normal locations. 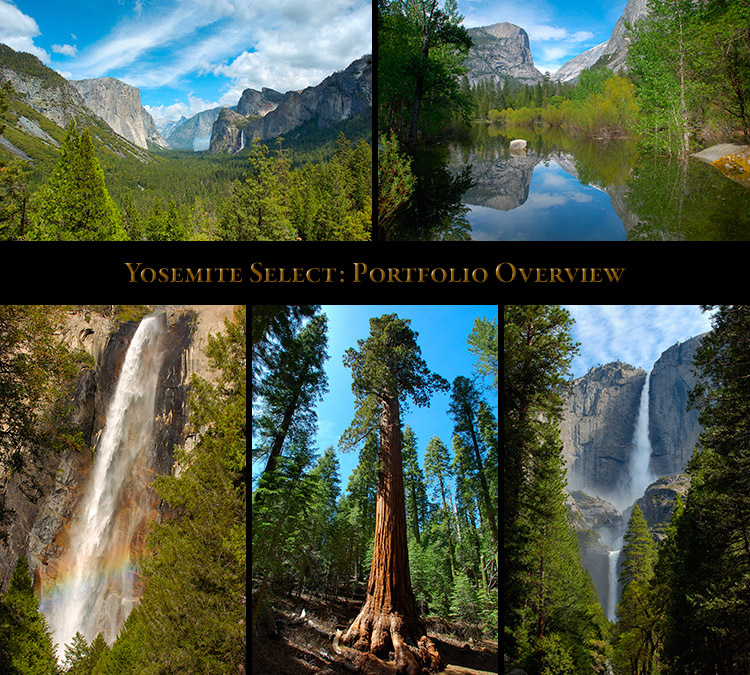 The Yosemite Select page is a 75 image Overview of the Yosemite National Park Portfolio. Wildlife and Plant Life. 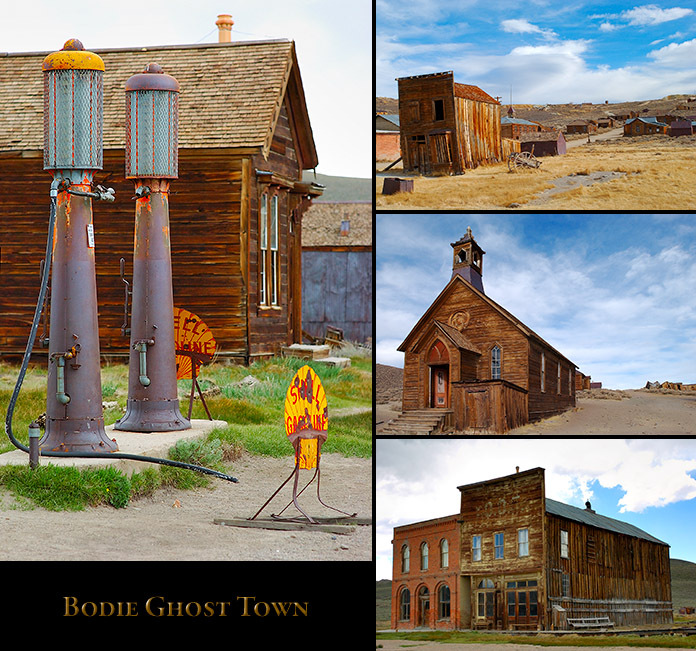 Bodie Ghost Town, Mono Lake and Mariposa are not displayed. 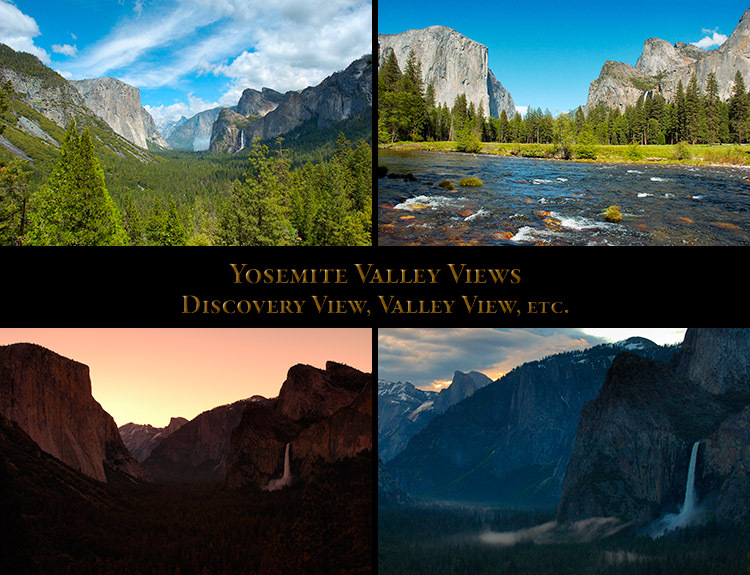 from the Gates of the Valley (Valley View), the iconic ground level view of Yosemite Valley. 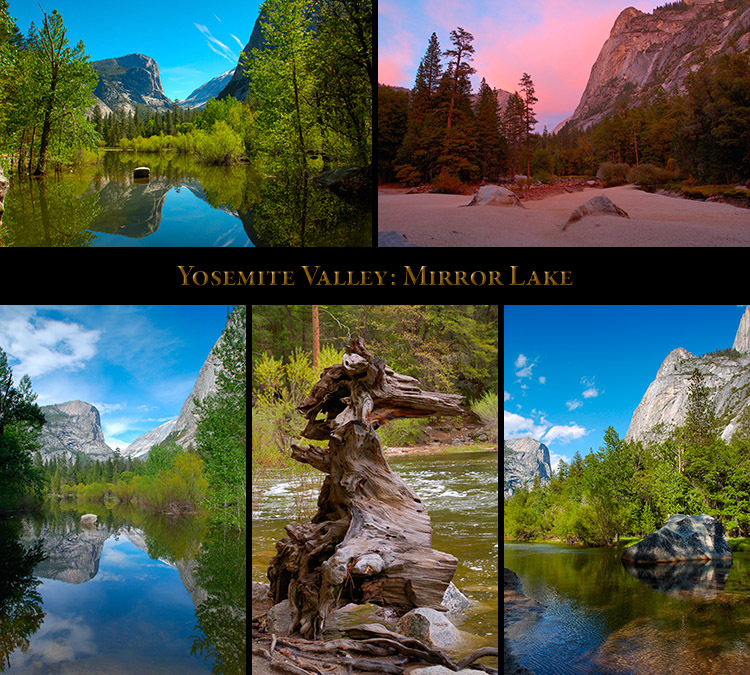 The Mirror Lake page has scenes from the trail and Yosemite’s famous disappearing lake. 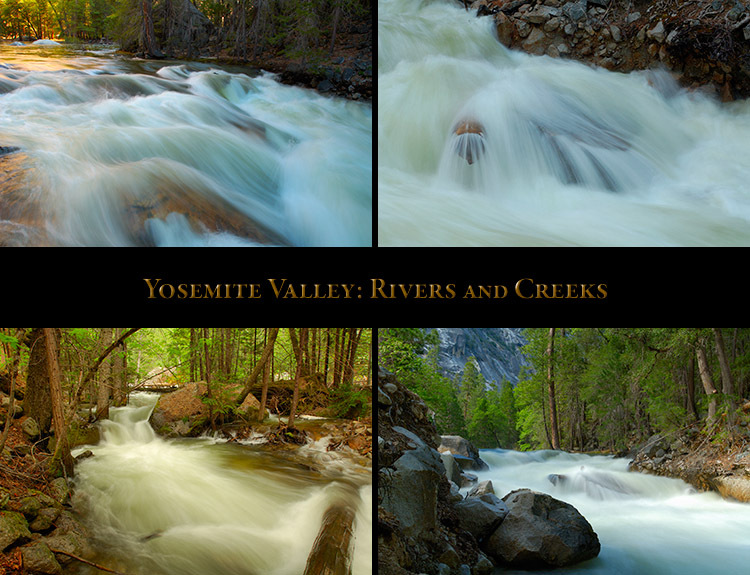 The Rivers and Creeks page shows scenic waterways (Merced River, Tenaya Creek, etc.). 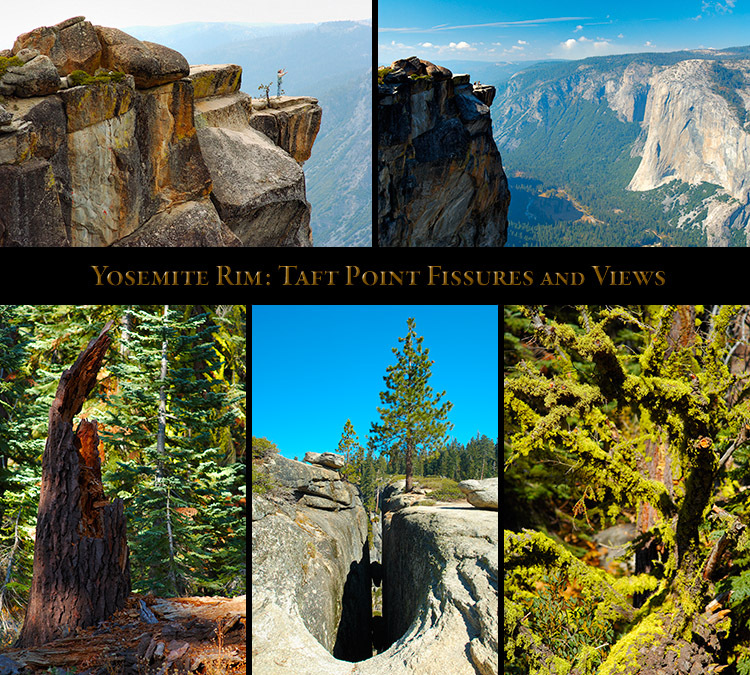 The Yosemite Valley Assorted page details many famous rock features of Yosemite NP. sample images and Display Composites linked to each page. seen by visitors who arrive from the south, as it is outside the eastern portal of the Wawona Tunnel. the Merced River. These two iconic scenes display the true grandeur of Yosemite Valley. 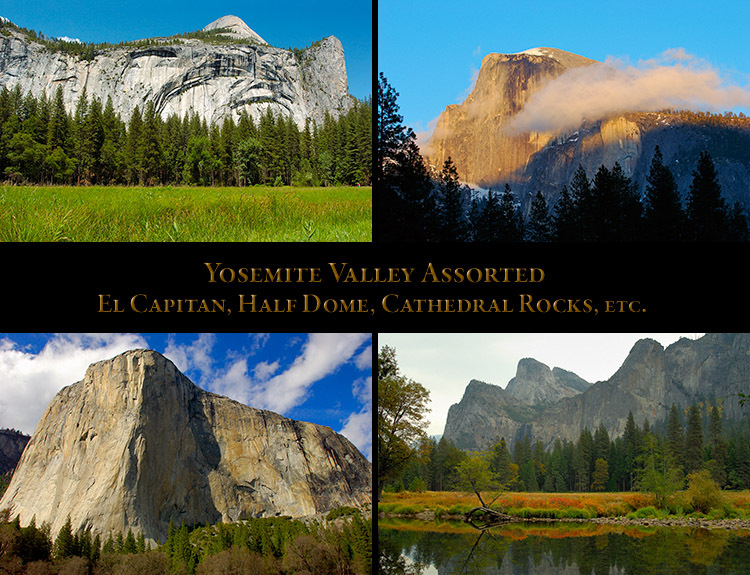 including Half Dome, El Capitan, Royal Arches, Cathedral Rocks, Sentinel Rock and more. 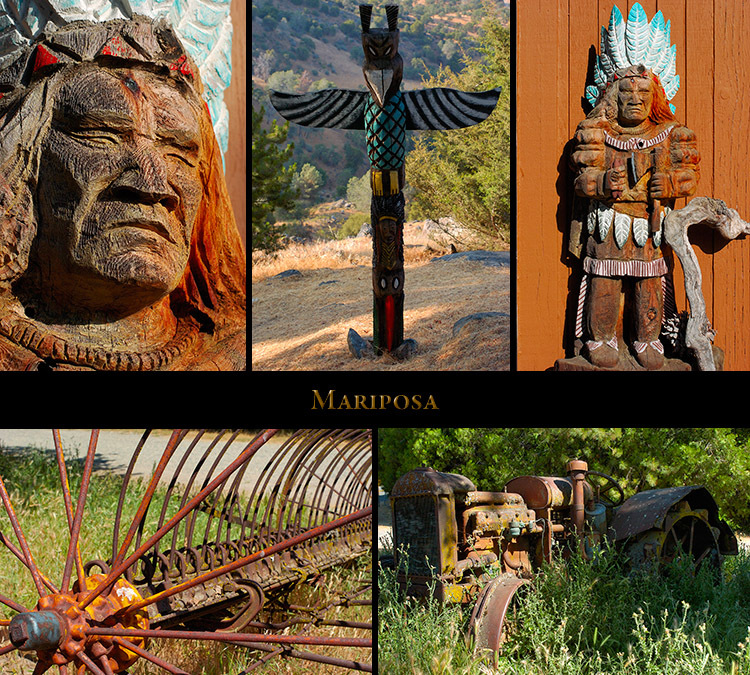 historic hotels, a historic locomotive, and several assorted scenic images from the valley. Mirror Lake is the last remnant of a large glacial lake that once covered Yosemite Valley. up by late summer. It is famous for the reflection of Mount Watkins in its placid waters. several images taken at various exposure times to create different visual character in the water. 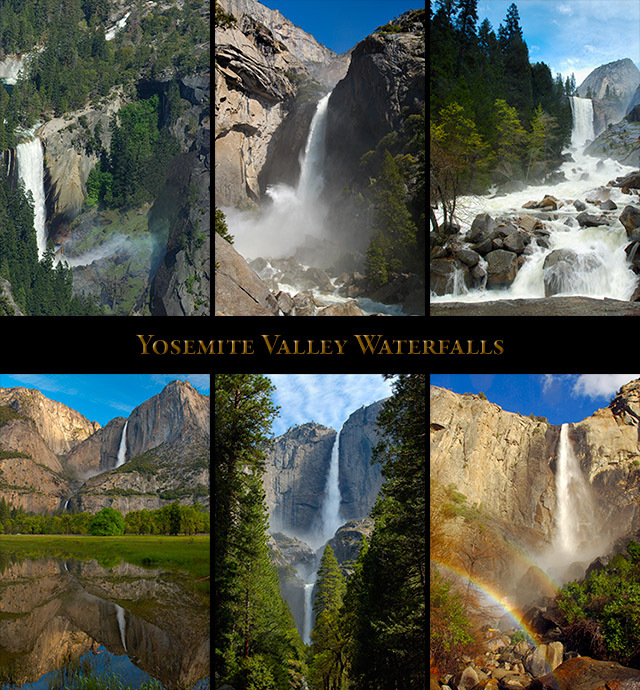 The waterfalls of Yosemite Valley are among the most spectacular in the world. 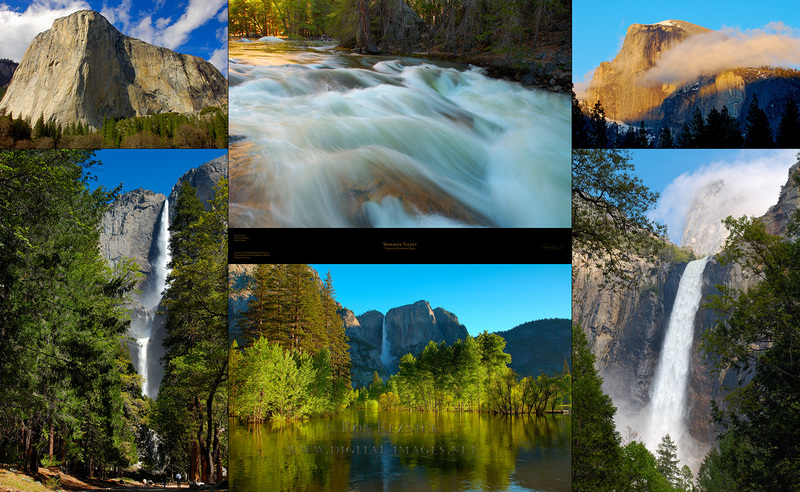 Nevada Fall, Vernal Fall, Yosemite Falls and more, taken over six years. Yosemite Falls is the signature waterfall in Yosemite NP and one of the tallest waterfalls in the world. the Middle Cascades (three falls and a cascade) drops 675 feet, and the Lower Fall drops 320 feet. 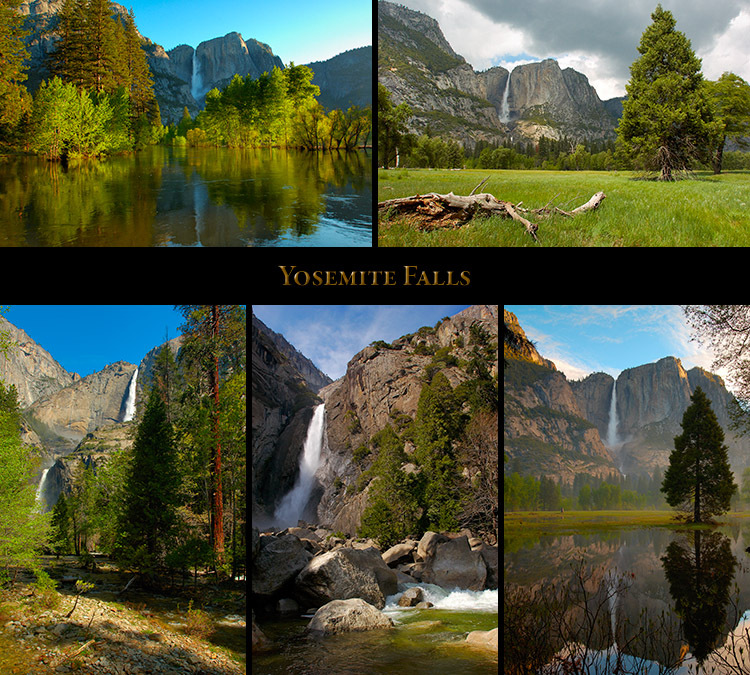 Yosemite Falls, considered the most beautiful in the USA, is visible from many places in the Valley. 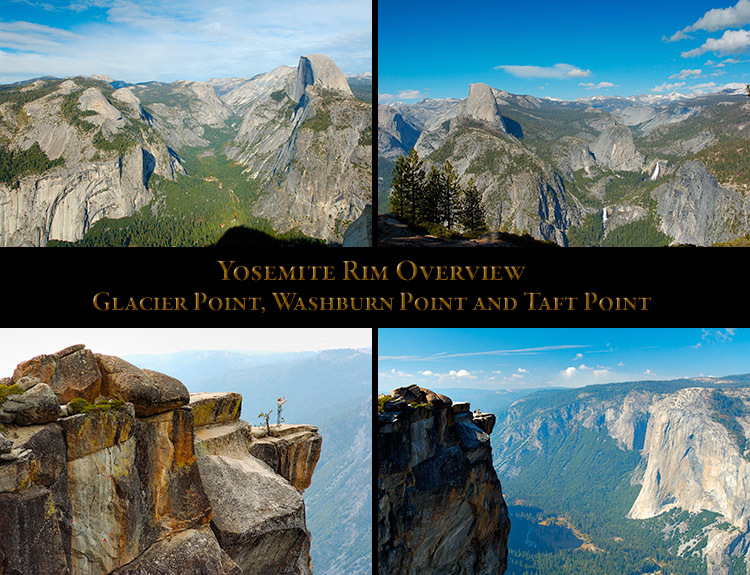 Glacier Point and Washburn Point on one page, and Taft Point on its own page. area, including Little Yosemite Valley and the Western Sierra Nevada Mountains. 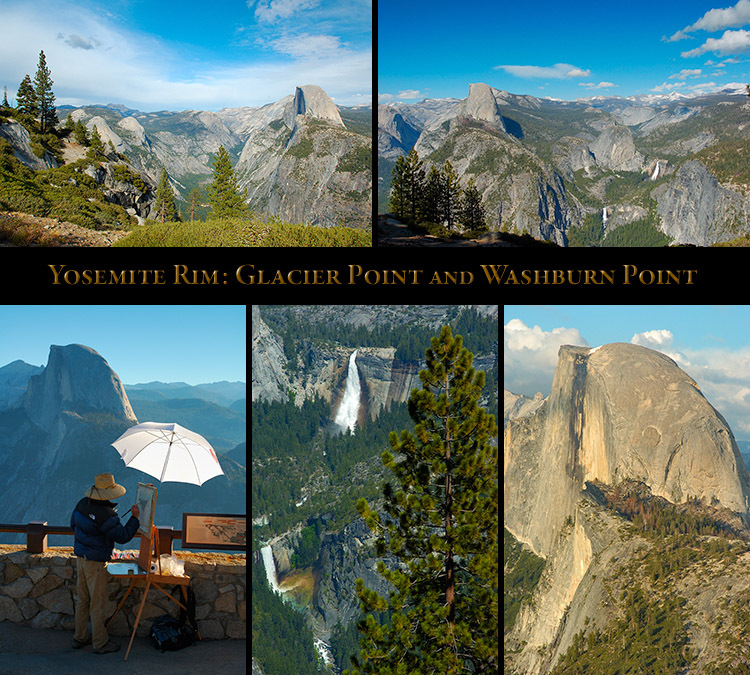 in the spring and summer, as they are accessible by car from the Glacier Point Road. Half Dome and Tenaya Canyon from 3200 feet over the valley floor is breathtaking. at the end of a one mile trail through Red Fir forest from the Glacier Point Road. an unprotected vertical drop of more than 1000 feet on the edge of Profile Cliff. Marmot taken in March, May and October, split into two separate pages. Steller’s Jays, an Anna’s Hummingbird and a White-Headed Woodpecker taken in March and May. Yellow-Bellied Marmot encountered at Olmsted Point above Tenaya Canyon on the Tioga Road. 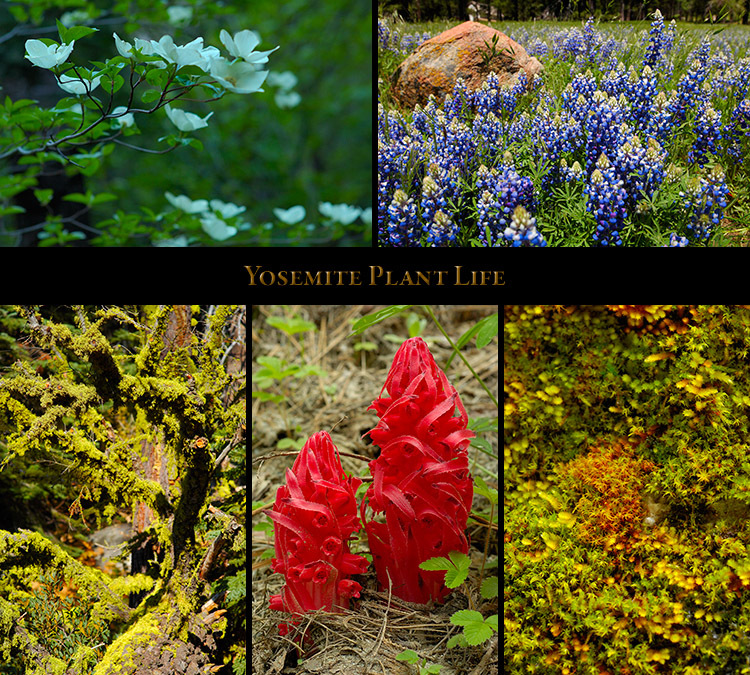 Yosemite Falls Trails, Snow Plants, Lupines, Thistle, Dogwood and other plants. 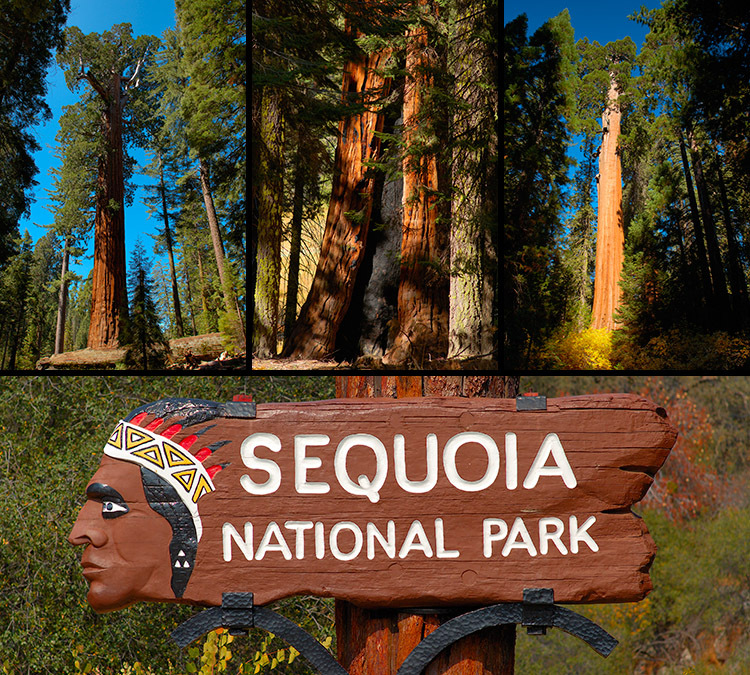 The section includes a page on Giant Sequoias of Sequoia NP and King’s Canyon NP. 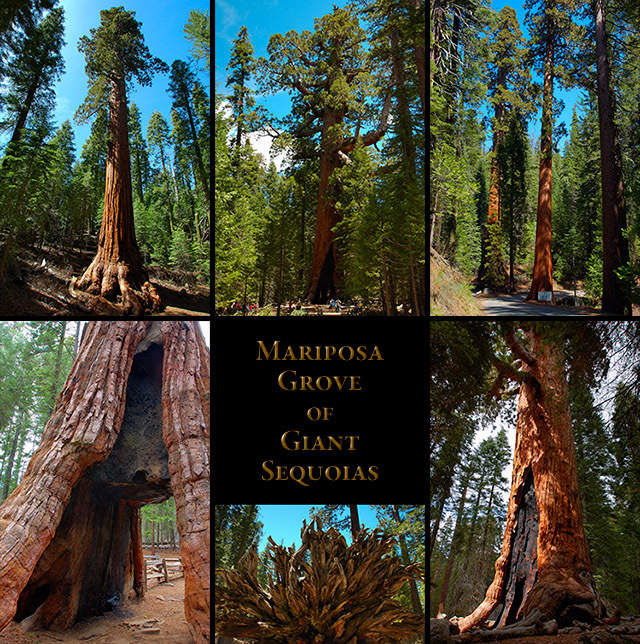 largest tree in the Mariposa Grove), and the California Tunnel Tree in the lower grove. the western Sierra Nevada mountains about three hours to the south of Yosemite National Park. The General Sherman and General Grant Sequoias are two of the world’s largest trees by volume. 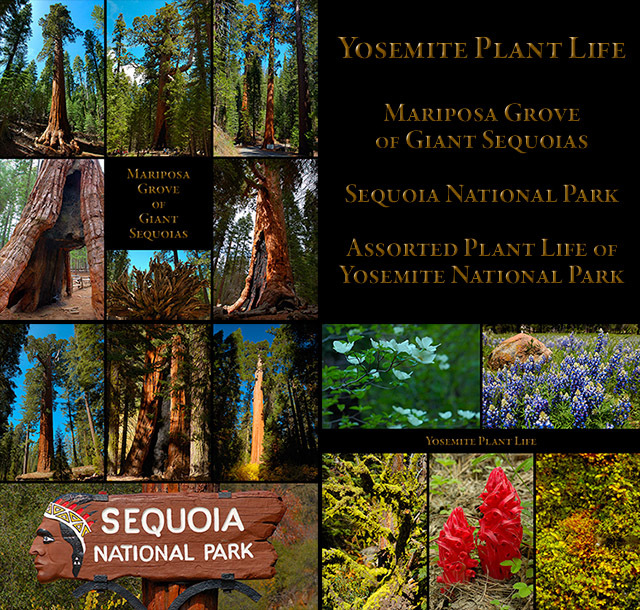 Wawona Meadows, Snow Plants on the Wawona Road and more are displayed on this page. 50 images of Bodie Ghost Town in the Eastern Sierras north of Mono Lake. remains, preserved in a state of “arrested decay” as a California State Historic Park. Mono Lake is at the eastern end of the Tioga Pass, which crosses the Sierras from Yosemite Valley. Ancestral home of the Yosemite-Mono Paiutes and Miwok, it is one of the oldest lakes in North America. and knobs formed by the interaction of freshwater springs and the alkaline waters of the lake. native raids. The Mariposa Battalion was the first group of white men to enter Yosemite Valley. 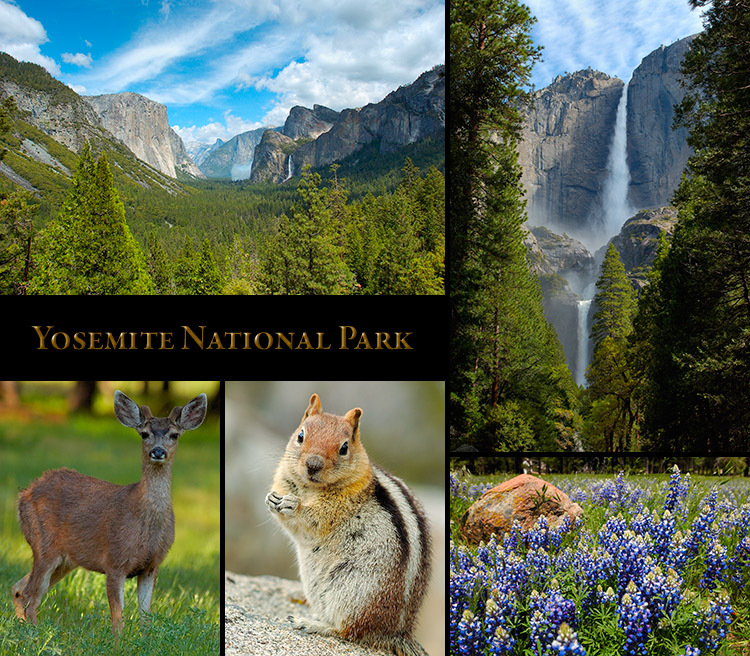 outside of Yosemite National Park, with easy access, reasonable costs and a bucolic environment. Upper and Lower Yosemite Falls, Yosemite Falls and Merced River, Bridalveil Fall.